fLaboratoire de Mathématiques Paul Painlevé (C.P. ), Lille, France. BACKGROUND AND PURPOSE: The TICI score is widely used to evaluate cerebral perfusion before and after the endovascular treatment of stroke. Recent studies showing the effectiveness and safety of mechanical thrombectomy combine modified TICI 2b and modified TICI 3 to assess the technical success of endovascular treatment. The purpose of this study was to determine how much clinical outcomes differ between patients achieving modified TICI 2b and modified TICI 3 reperfusion. 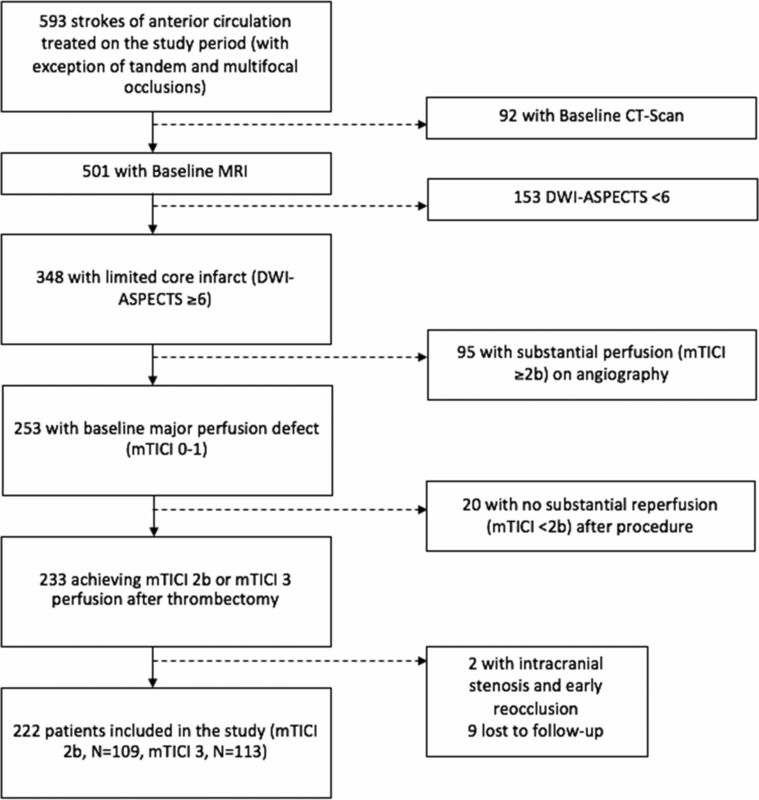 MATERIALS AND METHODS: We analyzed 222 consecutive patients with acute large intracranial artery occlusion of the anterior circulation having achieved modified TICI 2b or modified TICI 3 reperfusion after thrombectomy. The primary end point was the rate of favorable outcome defined as the achievement of a modified Rankin Scale score of 0–2 at 3 months. RESULTS: Patients with modified TICI 3 more often had favorable collateral circulation and atherosclerosis etiology, with a shorter time from onset to reperfusion than patients with modified TICI 2b (all P < .05). The number of total passes to achieve reperfusion was higher in the modified TICI 2b group (median, 2; interquartile range, 1–3, 1–9) versus (median, 1; interquartile range, 1–2, 1–8) in the modified TICI 3 group (P = .0002). Favorable outcome was reached more often for patients with modified TICI 3 than for those with modified TICI 2b (71.7% versus 50.5%, P = .001), with a similar difference when considering excellent outcome. In addition, patients with modified TICI 3 had a lower intracerebral hemorrhage rate (23.0% versus 45.0%, P < .001). CONCLUSIONS: Patients with modified TICI 3 reperfusion have better functional outcomes than those with modified TICI 2b. Given the improving reperfusion rates obtained with thrombectomy devices, future thrombectomy trials should consider modified TICI 2b and modified TICI 3 status separately. Thrombectomy is now recommended as the standard of care for acute ischemic stroke with proximal large-vessel occlusion in the anterior circulation,1 and successful revascularization is a major predictor of good outcome following endovascular therapy for acute large-vessel occlusions.2 The Thrombolysis in Cerebral Infarction score is currently used to assess cerebral perfusion before and after endovascular stroke treatment.3 Recent studies demonstrating the effectiveness of intracranial large-vessel reperfusion by using mechanical thrombectomy considered modified TICI (mTICI) 2b and mTICI 3 (complete reperfusion) to represent technical success,4 though some researchers have suggested that patients with mTICI 2b reperfusion have a poorer outcome than patients with complete reperfusion.5⇓–7 Thus, the aim of our study was to determine how much functional outcome differed between patients achieving mTICI 2b and those with mTICI 3 reperfusion after thrombectomy for acute stroke in the anterior circulation. In this retrospective study, data were extracted from a bicentric prospective clinical registry (EFFECTS registry, Endovascular Treatment at Foch Hospital–Rothschild Foundation for Ischemic Stroke) of consecutive patients treated by mechanical thrombectomy for acute cerebral infarct between January 2012 and November 2015. The local ethics committees approved the use of patient data for this retrospective analysis. All patients referred for endovascular treatment of acute intracranial large-vessel occlusion involving the anterior circulation, with the exception of tandem and multifocal occlusions, were potentially included. Inclusion criteria were the following: 1) middle cerebral artery M1 or M2 segment and/or intracranial internal carotid artery occlusion; 2) intracranial artery occlusion and acute stroke confirmed on cerebral MRA and DWI, respectively; and 3) achievement of mTICI 2b or mTICI 3 reperfusion status after endovascular treatment by mechanical thrombectomy. Exclusion criteria were the following: 1) patients without baseline functional independence (modified Rankin Scale score of >2), and 2) patients with tandem occlusions, with >1 cerebral territory involved or a large ischemic score (DWI-ASPECTS < 6). All patients were treated in a dedicated neuroangiography suite under general anesthesia or conscious sedation, after evaluation by a dedicated anesthesiology team. The thrombectomy device was chosen at the interventionalist's discretion, by using a stent retriever or A Direct Aspiration First-Pass Technique (ADAPT) in the first instance. Arterial occlusion site, time from symptom onset to groin puncture, procedure time, and time to reperfusion were recorded. Reperfusion results were reported by using the mTICI score and were defined as ranging from no reperfusion (mTICI 0) to complete reperfusion (mTICI 3), including partial reperfusion (mTICI 2). Partial perfusion occurs when the iodine contrast medium passes beyond the obstruction, opacifying the distal arterial bed but with a rate of entry of contrast material and/or its rate of clearance from the vascular bed slower than that in comparable areas not perfused by the previously occluded vessel. The contralateral cerebral angiography, often available for T-carotid occlusions, was used for comparison. In other cases, the arterial bed proximal to the occlusion could be used for comparisons. mTICI 2 was further divided into 2a and 2b as less than and greater than 50%, respectively.9 This definition is different from the original TICI score in which 2a was defined as less than two-thirds perfusion of the distal territory, and 2b, as greater than two-thirds perfusion.10 Collateral arterial supply was assessed by using the capillary index score,11 and patients were dichotomized into favorable and unfavorable collateral flow groups (capillary index score 2 or 3 and capillary index score 0–1, respectively). Periprocedural complications (embolization in a new territory, defined as an angiographic occlusion in a previously unaffected vascular territory observed on the angiogram after clot removal; arterial dissection or perforation; vasospasm; and subarachnoid hemorrhage) were also noted. Patients in this treatment arm received aspiration thrombectomy by ADAPT by using the 5MAX ACE Reperfusion Catheter (Penumbra, Alameda, California) as frontline therapy. The detailed technical procedure has been published previously.12 In brief, access was achieved through the femoral artery in compliance with the standard of care. A large-bore catheter was placed distally into the internal carotid artery to provide access for the 5MAX ACE aspiration catheter. Adhering to the instructions for use, we then performed aspiration by using the Penumbra Aspiration Pump (Penumbra, Alameda, California) in all cases. Angiography was performed following recovery to evaluate the flow rate. Steps were repeated if necessary until successful reperfusion to mTICI 2b–3 was achieved. The interventional neuroradiologist could, in case of reperfusion failure (mTICI < 2b) with ADAPT, use another thrombectomy device of the operator's choice (rescue therapy). Procedures were performed by using the Solitaire FR (Covidien, Irvine, California) or the Trevo device (Stryker, Kalamazoo, Michigan) via the femoral artery approach. Following the instructions for use of the stent retriever, we positioned a balloon catheter within the internal carotid artery to allow flow arrest during thrombus retrieval. The stent retriever was delivered through a microcatheter and deployed inside the thrombus. A control angiogram was performed to determine the immediate reperfusion status, and the device was left deployed for a minimum of 3 minutes. Subsequently, the device and microcatheter were slowly retrieved. A control angiogram was obtained to assess recanalization and reperfusion.13,14 This sequence was repeated until mTICI 2b or 3 flow (defined as successful reperfusion) was established. The interventional neuroradiologist could, in the case of reperfusion failure (mTICI < 2b) with the stent retriever, use another thrombectomy device of the operator's choice (rescue therapy). Use of complementary mechanical (intracranial angioplasty or stent placement) and/or pharmacologic treatment was recorded. Complementary pharmacologic treatments used were intra-arterial fibrinolysis (alteplase) or intravenous administration of abciximab (Reopro). All patients underwent cross-sectional imaging (CT or MR imaging) within 18–24 hours after the procedure. Intracranial hemorrhage (ICH) was classified according to the European Cooperative Acute Stroke Study (ECASS) criteria.15 Patients were evaluated 24 hours after the procedure by using the NIHSS, and “symptomatic intracranial hemorrhage” was defined as any intracerebral hemorrhage with an increase of at least 4 NIHSS points within 24 hours, or resulting in death. The mRS at 90 days was assessed by trained research nurses unaware of the study group assignments during face-to-face interviews or via telephone conversations with the patients, their relatives, or their general practitioners. The primary study outcome was the achievement of an mRS score of 0–2 at 3 months (favorable outcome). Secondary outcomes included excellent outcome (defined as an mRS score of 0–1), any ICH, all-cause mortality at 90 days, and procedural complications. Furthermore, attention was given to the type of endovascular procedure performed for all patients. Quantitative variables are expressed as means ± SD or medians (interquartile range [IQR]), and categoric variables are expressed as numbers (percentages). Normality of distributions was assessed by using histograms and the Shapiro-Wilk test. Bivariate comparisons between complete and mTICI 2b reperfusion groups were made by using the χ2 test or Fisher exact test for categoric variables, the Cochran-Armitage Trend test for ordinal variables, and the Student t test or Mann-Whitney U test for quantitative variables as appropriate. We assessed the heterogeneity in the relationship between successful reperfusion status and each outcome (excellent outcome, favorable outcome, 90-day mortality, and any ICH) across the 2 centers by using the Breslow-Day test. Comparisons in outcomes between the 2 successful reperfusion groups were further adjusted for the center and prespecified confounders regarding prior evidence of an association with clinical outcome (namely age, diabetes, admission NIHSS score, site of occlusion, collateral flow, etiology, previous IV thrombolysis, and onset to reperfusion time) by using logistic regression models.7 An additional adjustment for ICH occurrence was performed for comparison in functional outcomes (excellent and favorable). To avoid case deletion in multivariable analyses due to missing data on the collateral favorable covariate (missing in 14 patients), we imputed missing data under a missing-at-random assumption by using a regression-switching approach (chained equation with m = 10 imputations obtained by using the R statistical software, Version 3.03; http://www.r-project.org/).16,17 Imputation procedures were performed by using all variables listed in Table 1 and each study outcome. Multiple imputed datasets were combined by using the Rubin rules.18 Unadjusted and adjusted odds ratios for reaching each outcome were calculated by using mTICI 2b as the reference group. Statistical testing was performed at the 2-tailed α level of .05. Data were analyzed by using SAS software, Version 9.3 (SAS Institute, Cary, North Carolina). A total of 593 consecutive patients with an acute internal carotid artery or middle cerebral artery occlusion were treated by endovascular therapy at 2 comprehensive stroke centers (Fig 1). Of these, 92 with no baseline MR imaging, 153 with DWI-ASPECTS of <6, 95 with substantial perfusion on the baseline angiogram (mTICI≥2), and 20 with failure of endovascular treatment (final mTICI<2b) were excluded. Overall, 233 patients achieved successful reperfusion (mTICI≥2b) and were included in the study. Two initially included patients with intracranial stenosis and early arterial reocclusion were excluded, and 9 patients were lost to follow-up, resulting in a final study sample size of 222 patients. Among them, 113 (50.9%) achieved mTICI 3 reperfusion and 109 (49.1%) achieved mTICI 2b reperfusion. The median time of successful reperfusion from symptom onset was 291 minutes (IQR, 240–355). Baseline characteristics, including time from onset to reperfusion, number of passes to achieve reperfusion, and periprocedural complications are shown in Table 1, according to successful reperfusion status. There was no significant difference in age, vascular risk factors, admission NIHSS score, ASPECTS, or fibrinolysis administration between the 2 reperfusion groups. However, patients with complete reperfusion (mTICI 3) more often had favorable collateral flow and large-artery atherosclerosis etiology, together with a lower onset-to-reperfusion time than patients with mTICI 2b reperfusion (all P < .05). The number of total passes to achieve reperfusion was higher in the mTICI 2b group (median, 2; interquartile range, 1–3, 1–9) versus (median, 1; interquartile range, 1–2, 1–8) in the mTICI 3 group (P = .0002). Procedural complications (emboli into new territories, procedure-related arterial dissection or perforation, subarachnoid hemorrhage, and vasospasm) occurred in 9 (8%) patients with complete reperfusion and in 13 (11.9%) patients with mTICI 2b reperfusion (P = .32). ADAPT was used in the first instance in 110 patients (49.5%), among whom switching to the stent-retriever technique occurred in 12 patients (11%). The stent-retriever technique was used in the first instance in 112 patients (50.5%), and switching to ADAPT occurred in 3 (11.9%) of these. No difference was found regarding the use of adjunctive treatment. The distribution of 90-day mRS according to successful reperfusion status is shown in Fig 2. Favorable outcome (mRS ≤ 2) was achieved more often in patients with complete reperfusion than in those with mTICI 2b reperfusion (71.7% versus 50.5%, P = .001). A similar difference was found when considering excellent outcome (mRS < 2, Table 2). In addition, patients with complete reperfusion had a nonsignificantly lower mortality rate (8.9% versus 16.5%, P = .086) and a lower ICH rate (23.0% versus 45.0%, P < .001) compared with those with mTICI 2b reperfusion. Regarding the ECASS classification, HI1, HI2, PH1, and PH2 types occurred respectively in 20, 4, 1, and 1 patients with complete reperfusion and 22, 17, 4, and 6 patients with mTICI 2b reperfusion. Symptomatic ICH occurred in only 1 patient (0.9%) with complete reperfusion and in 4 patients (3.7%) with mTICI 2b reperfusion. Distribution of modified Rankin Scale scores at 90 days according to successful reperfusion status. We found no significant heterogeneity in the impact of successful reperfusion status on outcomes across the 2 centers (All P values for heterogeneity, >.26). After we adjusted for center and baseline between-group differences, mTICI 3 status remained significantly associated with an increased probability of excellent and favorable outcomes and a decreased probability of any ICH (Table 2). When comparison in functional outcomes was further adjusted for ICH, the differences were not modified; the adjusted ORs of excellent and favorable outcomes for complete relative to mTICI 2b reperfusion groups were, respectively, 2.55 (95% CI, 1.23–5.26) and 2.78 (95% CI, 1.28–6.08). Recent controlled trials demonstrating the efficiency and safety of mechanical thrombectomy4 consider that technical success of the endovascular procedure is achieved when mTICI 2b or 3 reperfusion is obtained. According to a recent meta-analysis of individual data about endovascular therapy, this threshold is reached in 71% of cases in the trials mentioned above.4 After a clinical study showing a trend to more favorable outcomes for patients with mTICI 3 compared with mTICI 2b but with no statistically significant difference,13 a consensus statement defined the mTICI 2b threshold as the target angiographic end point for technical success of mechanical thrombectomy.14 Since the MERCI trials era, it is well-accepted that greater degrees of recanalization are associated with an increased rate of favorable functional outcome.19 In the Interventional Management of Stroke (IMS) III study,5 though performed during the pre-stent-retriever period, the authors reported that the proportions of patients with mRS ≤ 2 at 90 days (primary outcome) increased with greater reperfusion. However, these studies had a lack of distinction between the various degrees of partial recanalization and the use of the Thrombolysis in Myocardial Infarction score. Currently, the mTICI score is widely used in the literature to assess cerebral reperfusion following stroke therapy.3 Indeed, it has been demonstrated to better correlate with clinical outcome than the Thrombolysis in Myocardial Infarction score.19 The current definition of the TICI 2b score (the modified TICI 2b) is the version introduced by the IMS investigators,20 which is simpler and shows better interrater agreement than the original definition. In our cohort, ICH was less frequent in patients with mTICI 3 than in those with mTICI 2b (23.0% versus 45.0%, P < .001). Both the time from symptom onset to reperfusion (median, 310 versus 285 minutes; P = .021) and the procedure time (median, 50 versus 40 minutes; P = .018) were longer in the mTICI 2b group. Delayed reperfusion and longer procedural times are independently associated with occurrence of intracranial hemorrhage in patients with large-vessel occlusion undergoing endovascular reperfusion therapy of stroke.22 These data are supported by experimental evidence.23 Mechanisms involved are multiple, mainly involving blood-brain barrier disruption.24 However, our results may be affected by the low frequency of symptomatic ICH in our study, which can be explained by our inclusion criteria, excluding patients with large-core infarcts, known to have a higher risk of ICH. Baseline collateral status varies in patients with acute ischemic stroke. Most patients in this study had good collateral flow. This is related to the selection of patients with proximal occlusion and both a limited clinical deficit and limited infarct core who likely have good collateral circulation.25 Nevertheless, we observed that patients achieving complete reperfusion had better collateral flow on baseline angiograms than those who did not. This finding is consistent with the literature, and a recent meta-analysis showed that good pretreatment collateral status may enhance the rate of both recanalization and reperfusion in patients with stroke receiving mechanical revascularization therapy.26 However, mechanisms of the effects of good collateral flow on successful revascularization remain poorly understood. One explanation may be that retrograde filling would allow neuroprotective agents (intrinsic or extrinsic) to access the clot.27 A mechanical effect of collateral flow facilitating clot removal may also provide an explanation. Our study has the limitations inherent in its retrospective design, with a relatively small sample size extracted from 2 centers. Bias related to missing data on collateral flow (n = 14) cannot be completely ruled out because multiple imputation procedures replacing missing values with a set of plausible values were performed under a missing-at-random assumption. No core laboratory has adjudicated MR imaging/MRA and angiographic findings, though mTICI, DWI-ASPECTS, and clinical outcomes were all assessed in a blinded manner. Among baseline characteristics, we observed more terminal carotid occlusion in the mTICI 2b group, though the difference was not significant. Intuitively, thrombus burden may be higher in this group, resulting in a lower complete reperfusion rate. Moreover, mTICI 2b reperfusion occurred in a heterogeneous group of patients with various parenchymal defects regardless of their clinical significance. Indeed, a patient presenting with a defect in the right prefrontal area will be categorized as mTICI 2b, as will be a patient with a defect in the right central area. However, their respective clinical outcomes may not be the same. Similarly, a parenchymal defect in the same area but located in the left or right hemisphere may have a distinct clinical outcome. Further research should be performed to analyze this heterogeneous subgroup of mTICI 2b, regarding the complex anatomy of the MCA and its territories of supply, and to take into account the lateralization of the defect as well. Second, we did not consider here the TICI 2c subcategory,28 defined by near-complete perfusion except for slow flow or distal emboli in a few distal cortical vessels. However, Almekhlafi et al28 reported similar clinical outcomes between TICI 2c and TICI 3. We found that patients with mTICI 3 reperfusion achieve better clinical outcomes and less hemorrhagic transformation than patients achieving mTICI 2b reperfusion. Therefore, mTICI 3 may be considered as representing the optimal technical success in reperfusion and a target end point for the neurointerventionalist. Future thrombectomy devices or techniques should focus on achieving mTICI 3 reperfusion. Our results, though requiring confirmation in further studies, suggest considering patients with mTICI 2b and mTICI 3 separately in future prospective studies evaluating the effectiveness of mechanical thrombectomy. Moreover, other potential areas for future research could include a subgroup analysis of the recent major stroke trials or an analysis of one of the major stroke data bases (such as Get With The Guidelines Stroke Registry of the American Heart Association), with comparison of mRS outcomes between patients with mTICI 2b versus mTICI 3 reperfusion. Disclosures: Guillaume Taylor—UNRELATED: Payment for Lectures including service on Speakers Bureaus: Stryker, Medtronic, Comments: lectures regarding intracranial stenting for aneurysm treatment*; Travel/Accommodations/Meeting Expenses Unrelated to Activities Listed: Astra Zeneca, Medtronic, Comments: meeting on antiplatelet treatment protocols for a stroke course. Michel Piotin—UNRELATED: Consultancy: Medtronic, Stryker, MicroVention, Penumbra, Balt*; Payment for Development of Educational Presentations: Medtronic, Stryker, MicroVention, Balt. * *Money paid to the institution. R.B. and M.P. received institutional grants from Stryker, Medtronic, MicroVention and Balt. B.L. received travel funding from Medtronic and speaker honoraria from Penumbra. Drs Piotin and Blanc are proctors for a Medtronic Pipeline case. Accepted after revision August 18, 2016. Striving for the Best: How Far Should We Go? Regarding "Impact of Modified TICI 3 versus Modified TICI 2b Reperfusion Score to Predict Good Outcome following Endovascular Therapy"